My parent’s neighborhood is full of citrus trees. There actually used to be many more but last year’s freeze hurt several – including my favorite sour orange tree (no more Cuban marinades this year). Still though, you can find meyer lemons, limequats, kumquats, grapefruits, calamondins and more from one yard to the next. My mother and I have the tendency to walk from house to house picking fruit (I brought back a car load on Tuesday!). No one ever seems to mind considering everyone has more fruit than they know what to do with. When there is such amazing fruit, it’s hard not to include as much of it in the Christmas menu as possible. I found this simple recipe for Lemon Cheesecake with Gingersnap Crust using my iPhone Epicurious App – in full laziness while laying on the couch chatting with my Mom. We both agreed it sounded delicious and I sent my Mom to Judy’s and Debbie’s yards to harvest some meyer lemons and limequats. Beware – this recipe is HUGE! I had so much extra filling that I ended up making a couple tiny cheesecakes in addition to this one. You could cut back – or just treat your friends and neighbors with some small cheesecakes (I believe in karma and this is a good way to stock up!). 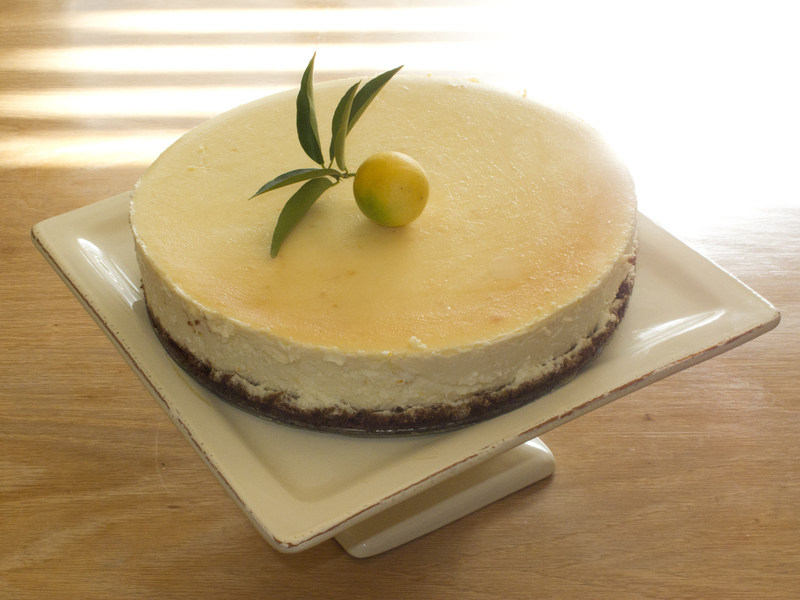 This recipe is very easy – plus one of the fluffiest cheesecakes I’ve made. I doubled the lemon juice because I thought it needed an extra kick – feel free to add as much as you think tastes good. This was so good that my sister, Maggie, is making it for her New Years Eve party! How are you celebrating? For crust: Preheat oven to 350°F. Stir cookie crumbs and butter in medium bowl until evenly moistened. Press mixture onto bottom of 9-inch-diameter removable-bottom cheesecake pan with 3-inch-high sides. Bake crust until deep golden, about 12 minutes. Cool completely. Reduce oven temperature to 325°F. For filling: Using electric mixer, beat cream cheese in large bowl until smooth and fluffy. Gradually beat in sugar, then salt. Beat in eggs, 1 at a time. Beat in sour cream, grated lemon peel, and lemon juice. Pour filling into pan. Place wrapped cake pan in large roasting pan. Pour enough hot water into roasting pan to come halfway up sides of cake pan. Bake cake until filling is slightly puffed and moves only slightly when pan is shaken gently, about 1 hour 25 minutes. Remove cake pan from water bath; remove foil. Cool cake in pan on rack 2 hours. Chill uncovered until cold; cover and keep chilled at least 1 day and up to 2 days. Cut around pan sides; carefully loosen pan bottom from sides and push up pan bottom to release cake. It was an amazing cheesecake, very light. It also looked amazing. I give it an A+.